Doubling Living Spaces With An Ely Orangery. Once upon a time there was a brick Victorian House that looked a little sad. While beautiful from the street, with her double bay windows, the interior spaces were dark and didn’t allow the owners to live the contemporary lifestyle they craved. So they decided to give her an extreme makeover by adding a modern double story extension to the back of the house. But then they went one step further. 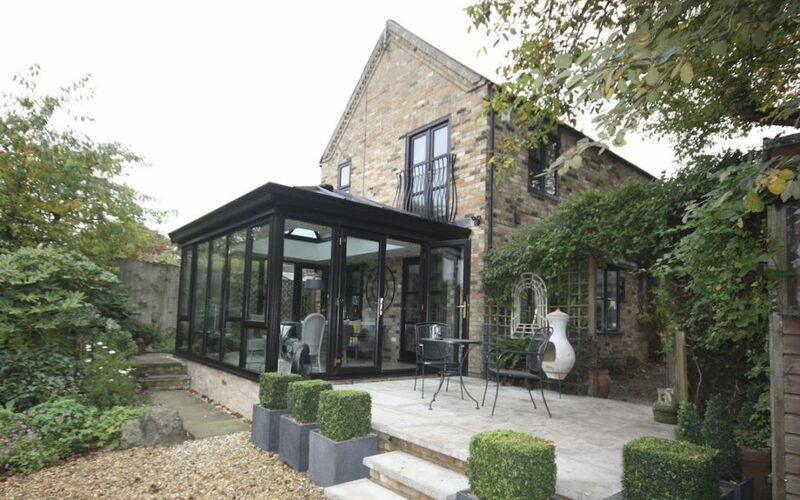 Not only did they create open plan living spaces inside the house, but they added a Contemporary Orangery to the back of the new extension which would allow them to enjoy the light and the garden whatever the weather. When they approached the Cambridge Conservatory Centre, they were looking for for a truly contemporary design that would compliment the new modern extension. While the original part of the house had white painted windows, the new extension included dark wood grained uPVC windows and doors and it was this finish that was chosen for the new Orangery. 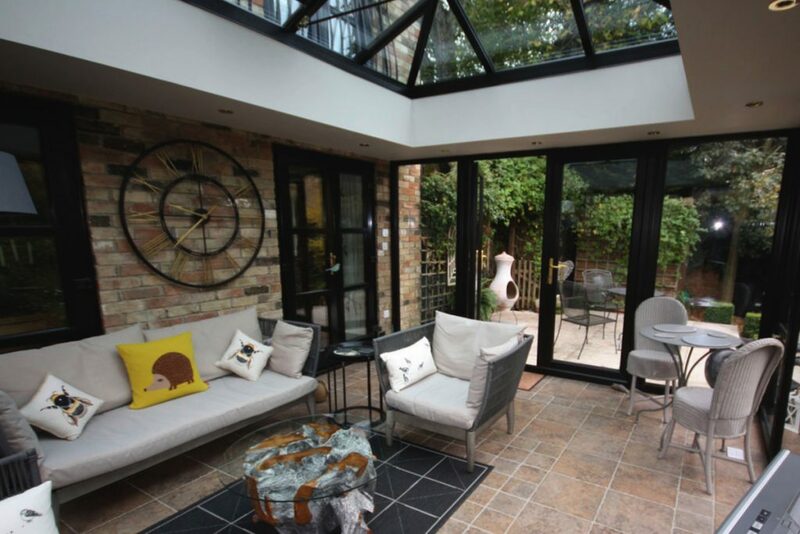 Making a definite statement against the brickwork of the house, the Orangery floor was chosen to match and bring a sense of warmth to the north facing room. 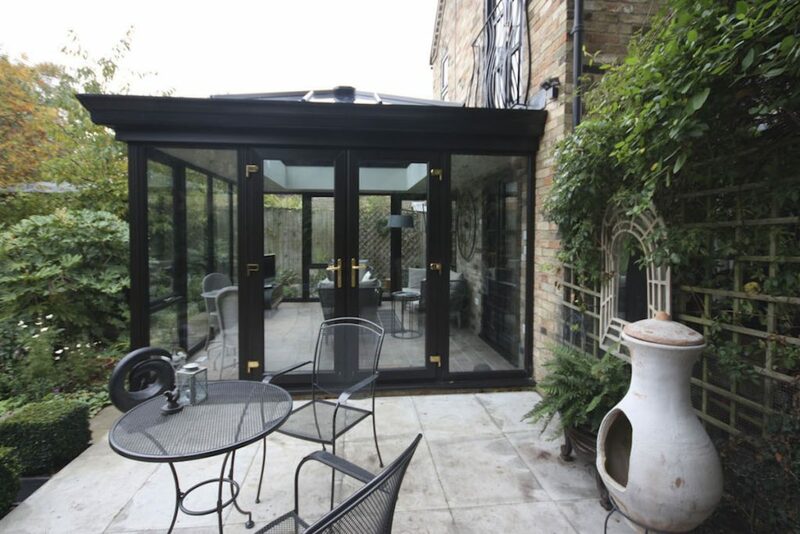 Outside, the gorgeous patio paved with light grey slabs highlights the black iron furniture and the lush planting inviting you to open the fully glazed French Doors to explore the garden beyond. Inside this Ely Orangery, a comfy sofa and two chairs deliver the perfect place to sit and relax for a while. Double doors to either side of of a central wall that hosts a feature clock, allow the owners to flow between the main house and the new Orangery with ease. With glass on three sides and a stunning lantern roof, this orangery is flooded with light despite it’s north facing position. 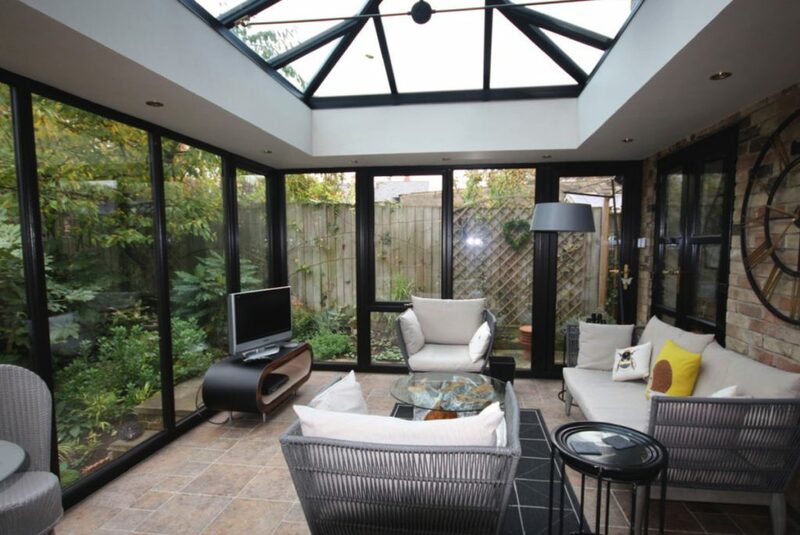 With a nod to 1950’s retro design, this Ely Orangery has a slightly zen feeling. The large glass panes in the windows bring the outside greenery up close and blur the lines between the protected space of the Orangery and the beauty of nature beyond. A truly spectacular addition to a grand old lady!